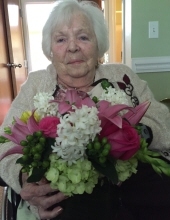 DURHAM: Janice Roslyn Itkin, 88, passed away on Wednesday, November 28, 2018 at Hillcrest Convalescent Center in Durham. Ms. Itkin was born August 24, 1930 in Chicago, Illinois. She was predeceased by her parents, Albert and Fannie Lapedus; husband, Aaron Itkin; and sisters, Zelda Craig, Myra Fishman, Sally Bemoras. Janice was born and raised in Chicago, IL where she and her beloved husband raised their four children. Together they enjoyed their retirement years in Las Vegas. Janice had a special bond with her three sisters. Her proudest accomplishment was receiving the American Legion Award when graduating from Marshall High School. She was a proud patron and valued employee of Marshall Fields. She will be eternally grateful to her dear friend, Virginia. Janice is survived by her sons, Stuart Itkin (Andrea), David Itkin (Nancy); daughters, Sheryl Zimmerman (Philip Sloane), Marci Cohen (Paul); grandchildren, Alan Itkin (Beth), Matthew Itkin, Ryan Zimmerman (Leah), Erica Hertzberg (Brian), Rachel Zimmerman, Daniel Itkin, Joel Itkin, Alexa Cohen, Ethan Cohen, Emily Cohen, Jason Itkin, Jessica Itkin; and great-grandchildren, Malcolm Aaron Hertzberg, Charlotte Hertzberg, Gabriella Zimmerman, Madeleine Hertzberg, William Zimmerman, Joseph Aaron Itkin. A graveside service will be held at 1:30 p.m. on Friday, November 30th at Markham Memorial Gardens with Rabbi Steve Kirschner officiating. In lieu of flowers, memorial donations may be made to the Alzheimer’s Association: 225 N. Michigan Ave., Fl. 17, Chicago, IL 60601. The family is being assisted by Clements Funeral and Cremation Services, Inc. in Durham. A full-length obituary can be found www.clementsfuneralservice.com. To send flowers or a remembrance gift to the family of Janice Roslyn Itkin, please visit our Tribute Store. "Email Address" would like to share the life celebration of Janice Roslyn Itkin. Click on the "link" to go to share a favorite memory or leave a condolence message for the family.